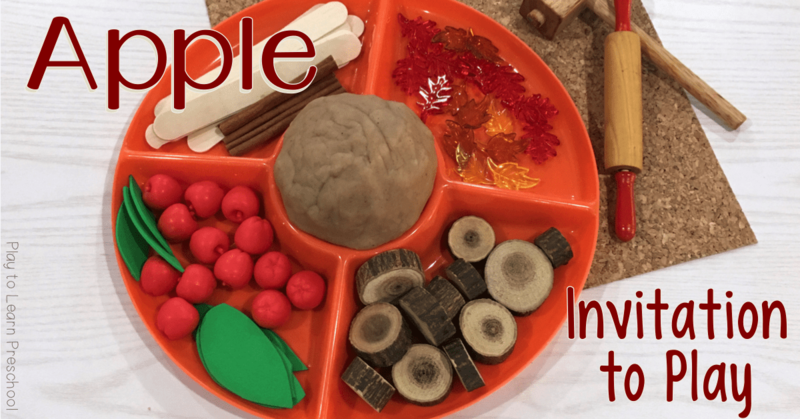 Have you tried making our apple cinnamon play dough? We used it in our five senses lesson, but it is also perfect for Autumn and goes great with our apple taste test lesson. 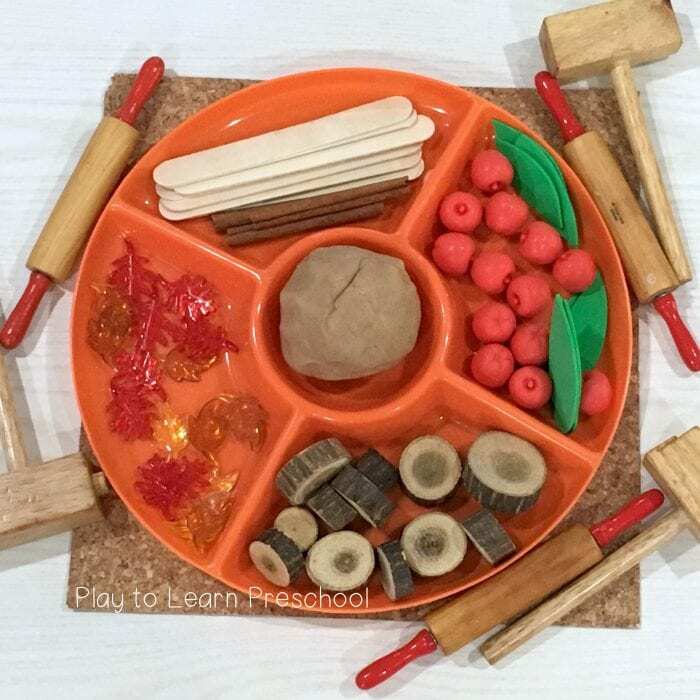 Using simple items, you can create an invitation to play that will make your play dough center even more irresistible! One of the great things about preschoolers is that they find joy in the little things. Use a variety of dollar store and “found” items to help entice their imaginations. Start with a dollar store veggie tray. The compartments are great for organizing the items visually, and that center spot is perfect for the big ball of dough – and it only costs a dollar! 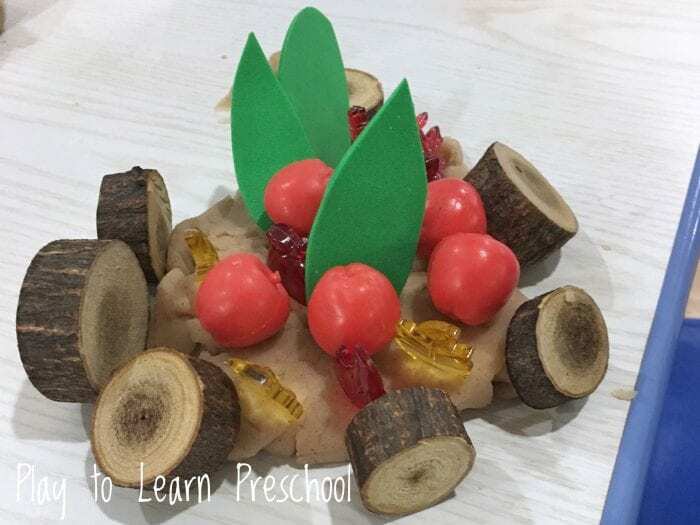 Many teachers avoid play dough – but it is an important tool disguised as a fun activity. 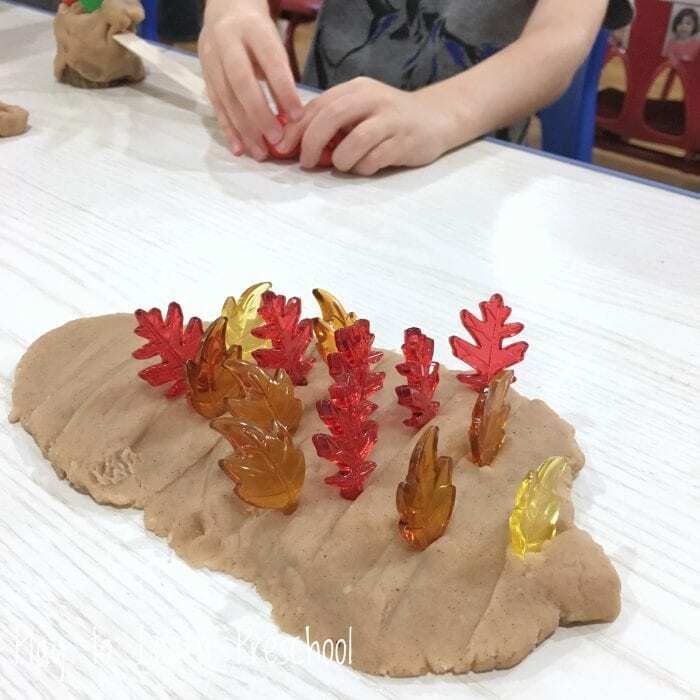 Yes, it can be messy, but spend some time with the students at the beginning of the school year playing with them and demonstrating how to use the materials and also how to clean up and care for them. Pinching and manipulating the dough strengthens the muscles in the hands, which is essential for writing. Kneading the dough and rolling it out with rolling pins uses the muscles in their arms and shoulders, which makes it a calming activity by providing large muscle pressure and input. Rolling balls of dough uses coordinated movement using both hands simultaneously, which increases coordination. 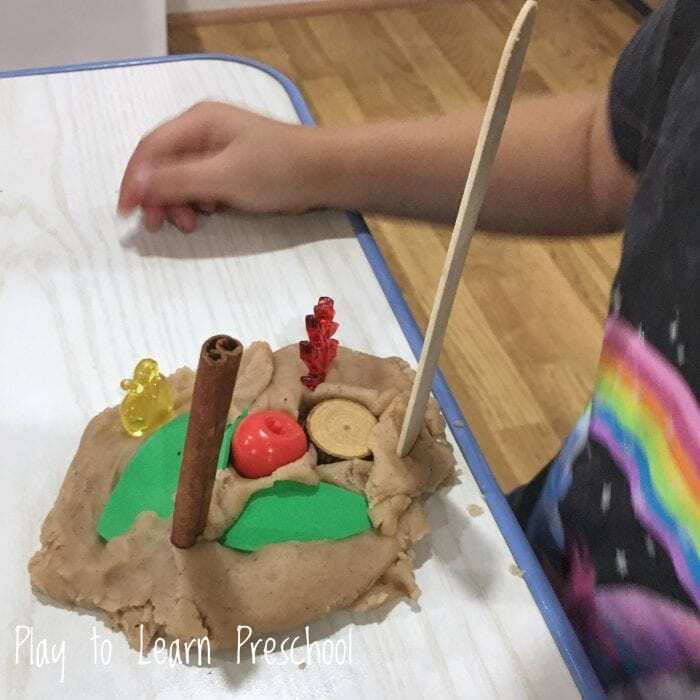 Creating items with the play-dough increases symbolic learning – the play dough apple pie isn’t REALLY an apple pie, for example. Talking about their creations while working in a group helps expand their vocabulary and their social skills. Need more reasons? Check out what NAEYC has to say about the benefits of play dough! How cool is this 3D play dough sculpture? 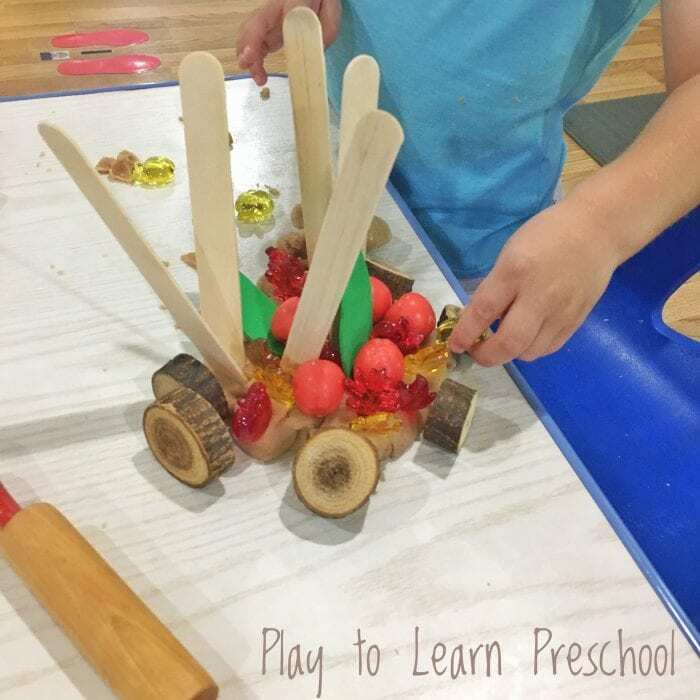 Open-ended play leads to a variety of different constructions. Remember to encourage the children to talk about what they’ve made, to compare and contrast with each other creations. Want to hear us talk about it? Have questions? Check us out on Facebook! 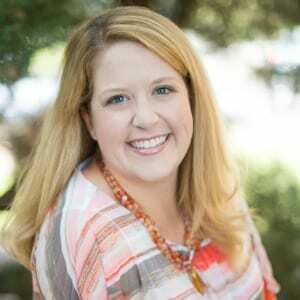 Previous Post: « Fabulous Fall Books for Preschoolers!